The Soviet Union, officially the Union of Soviet Socialist Republics (USSR) was a socialist state in Eurasia that existed from 1922 to 1991. It was nominally a supranational union of national republics, but its government and economy were highly centralized in a state that was unitary in most respects. Although each republic had its own communist party, the Union was a one-party state, federal in nature and governed by the all-Union party, the Communist Party of the Soviet Union. The Russian republic (which was itself federative) was not privileged by law, but the Russian nation was in some respects culturally dominant. The Union's capital was Moscow. The Soviet Union had its roots in the October Revolution of 1917, when the Bolsheviks, led by Vladimir Lenin, overthrew the Russian Provisional Government that had replaced Tsar Nicholas II. This established the Russian Socialist Federative Soviet Republic (Russian SFSR) and started the Russian Civil War between the revolutionary "Reds" and the counter-revolutionary "Whites." The Red Army entered several territories of the former Russian Empire and helped local communists take power through workers' councils called "soviets", which nominally acted on behalf of workers and peasants. In 1917 the Provisional Government reprinted the old Tsarist designs, but sold them imperforate. The first stamps of the Russian Soviet Federative Socialist Republic appeared in 1918, as two values depicting a sword cutting a chain. While great quantities of these stamps survive, they saw little use, and used copies are worth more than mint. In the years of the Civil War, postage stamps served as a kind of currency in a number of regions. The next stamps appeared in 1921, after inflation had taken hold. The set's values range from 1 to 1,000 rubles. By the next year these stamps were being surcharged in various ways, with face values of up to 100,000 rubles. Postage stamps of the USSR were issued in the period 1923 to 1991. They bore the specific inscription Russian: "Почта СССР" ("Post of the USSR"). The thematics of Soviet stamps mirrored to a large extent the history, politics, economics and culture of this world's first socialist state. Click on image for detail description. Click on year number to see all Paleontology and Paleoanthropology related stamps issued in the year. Aleksandr Karpinskiy (1847 - 1936) USSR most known as First elected president of Russian Science Academic. However, he was also great geologist and paleontologist, who made some important discovers at Ural mountains area of Russia. 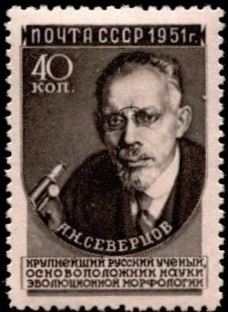 Aleksei Nikolaevich Severtsov (1866-1936) shown on on the gray stamp, was Russian zoologist and paleontologist, the founder of evolutionary animal morphology. Severtsov won worldwide recognition with major works dealing with metamerism of the head (1891–1901), the origin of the paired extremities of vertebrates (1900, 1908, 1926), and the evolution of lower vertebrates (1916–27). In his work on phytogeny Severtsov sought to correlate the results of studies in comparative anatomy and embryology with paleontological findings, stressing the need for studying the structure, development, and functional significance of all systems. More info is here. 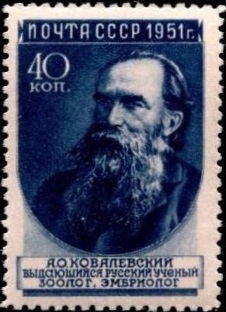 Kliment Arkadievich Timiryazev (1843 – 1920), shown on the brown stamp, was a Russian botanist and physiologist and a major proponent of the Evolution Theory of Charles Darwin in Russia. More info is here. Two other stamps of the set shows brother and wife of Vladimir Onufreivich Kovalevsky , Russian biologist and paleontologistwho was depicted on stamp one year later. Alexander Onufrievich Kovalevsky (1840 -1901), shown on the blue stamps, was Russian embryologist of Polish descent who is best known for his studies of animals. His research showed that all animals go through a period of gastrulation (the process by which the young embryo acquires its three germ layers). Kovalevsky was the Russian founder of comparative embryology and experimental histology. His demonstration of a common development pattern in the embryological development of multicellular animals, both vertebrates and invertebrates, provided important evidence of the evolution of living organisms. More info is here. 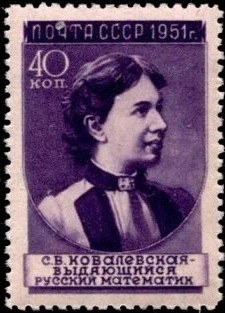 Sofia Vasilyevna Kovalevskaya (1850–1891), depicted on violet stamp, was a Russian mathematician who made noteworthy contributions to analysis, partial differential equations and mechanics. She was the first major Russian female mathematician and a pioneer for women in mathematics around the world. She was the first woman appointed to a full professorship in Northern Europe and was also one of the first women to work for a scientific journal as an editor. Her sister was the socialist and feminist Anne Jaclard. Despite her obvious talent for mathematics, she could not complete her education in Russia. At that time, women there were not allowed to attend universities. In order to study abroad, she needed written permission from her father (or husband). Accordingly, she contracted a "fictitious marriage" with Vladimir Kovalevskij, then a young paleontology student who would later become famous for his collaboration with Charles Darwin. More info is here. Vladimir Onufreivich Kowalewskij (1784-1856) Russian paleontologist and supporter of Darwinism. Intrigued paleontology higher vertebrates, especially cloven-hoofed animals. He was the one who assumed horses are appeared first in Europe continent then migrate to North America, then come back to Europe. Evidence of this theorie found more then 100 years after his suicide due to some trouble in private and commercial life in Grube Messel by Darmstadt, Germany. Very little prehistoric hourse in size of a big dog was found there and depicted on stamp of BRD in 1978. Franz Rouile (1814 - 1858) Russia Roulier was active in the field of geology and paleontology of the suburbs, creating a foundation for the development of evolutionary paleontology. He introduced the comparative historical method of investigation of the organic world. Roulier work on studying the instincts of animals and their mental activity laid the foundations of evolutionary trends in animal psychology. "XII International Botanical Congress" took place between 3 and 10 July in Leningrad (now St. Peterburg) . The logo of the congress surrounded with 5 different plants: four modern and one fossil: Livistona palibinii at top. The same fossil depicted on illustration and imprinted stamps on two post stationary (cover and post card) as shown below. [O1] Carl Linne (1707 - 1778) Sweden Carl Linnaeus, was a Swedish botanist, physician, and zoologist,who laid the foundations for the modern scheme of binomial nomenclature uses in all biology related since, include paleontology. He is known as the father of modern taxonomy, and is also considered one of the fathers of modern ecology. [O2] Vladimir Afanasyevich Obruchev (1863- 1956) was a Russian and Soviet geologist who specialized in the study of Siberia and Central Asia, as well as one of the first Russian science fiction authors., who found big fossil site in Gobi desert of Mongolia.He was the first who found some bones of tertiary mammals (rhinoceros tooth) in a hollow-Kuldzhin Gobi of Inner Mongolia in 1892. It is radically altered the previous understanding of the Gobi desert as the area covered by marine Tertiary sediments. Finding Obruchev and guidance AA Borisyak the development of the Middle Quaternary mammalian fauna of Central Asia have been used by the expedition of the American Museum of Natural History in the study of the southern Gobi the surrounding areas of Inner Mongolia. From 1922 to 1925, the expedition discovered a number of localities of reptiles and mammals in continental deposits, which were then subdivided into 12 successive horizons of Cretaceous and Tertiary age. Especially interesting and sensational discovery was the discovery of Cretaceous mammals, dinosaur eggs and nests. The American expedition was a light, mobile, technically equipped and great composition. This allows them to search and collect materials over large areas. "No matter how significant the opening of the Americans - wrote AA Borisyak - yet the first major discoveries in Asia, though much farther west, were made by Russian hunters". [O3] Prehistoric animals on cave painting shown on the backround of "XIII international congress of historical sciences"
10.03.1975 VIII "International Congress on Stratigraphy and Geology Carbon"
.1976 "Permafrost research station in Yakutia" [PS1] .1982 "Russian paleontologist and author I. A. Efremov" [PS2] 19.11.1986 "Soviet geologist and paleontologist A.A. Chernov"
29.12.1986 "Permafrost research institute, Yakutia" [PS1] 13.02.1989 "Soviet geologist and paleontologist D.V. Nalivkin"
The first permafrost research station in Yakutia was established in the summer 1941 in the south-western vicinity of Yakutsk where MPI now stands. The station was headed by Pavel Melnikov. In 1956, the station was reorganized into the North-Eastern Department of the Obruchev ( Vladimir Afanasyevich Obruchev depicted on USSR stamp in 1963) Permafrost Institute in Moscow and, four years later, into the Permafrost Institute, subordinate to the Siberian Branch of the USSR Academy of Sciences. .1990 "The monument to the mammoth in Kuleshovka" [PSO2] 13.05.1991 "The monument of fighting Brontosaurus with Ceratosaurus"
[PSO1] Amber is fossilized tree resin, which has been appreciated for its color and natural beauty since Neolithic times. The Baltic region is home to the largest known deposit of amber, called Baltic amber or succinite. It dates from 44 million years ago (during the Eocene epoch). It has been estimated that these forests created more than 100,000 tons of amber. Today, more than 90% of the world's amber comes from Kaliningrad Oblast of Russia. Amber is a unique preservational mode, preserving otherwise unfossilizable parts of organisms; as such it is helpful in the reconstruction of ecosystems as well as organisms; the chemical composition of the resin, however, is of limited utility in reconstructing the phylogenetic affinity of the resin producer. Amber sometimes contains animals or plant matter that became caught in the resin as it was secreted. Insects, spiders and even their webs, annelids, frogs, crustaceans, bacteria and amoebae, marine microfossils, wood, flowers and fruit, hair, feathers and other small organisms have been recovered in ambers dating to 130 million years ago. In August 2012, two mites preserved in amber were determined to be the oldest animals ever to have been found in the substance; the mites are 230 million years old and were discovered in north-eastern Italy. [PSO2] The monument to the mammoth in Kuleshovka (Ukraine) is the first such monument in the world. Established in 1841 in honor of the paleontological find, made in 1839 by the Ukrainian naturalист, professor of the Kharkiv University I. Kalinichenko. He dug out a well-preserved skeleton of Mammuthus trogontherii (steppe mammoth) , discovered during construction of distillery. Besides the skeletons of mammoths many bones of other prehistoric mammals of the Ice Age such as woolly rhinoceros, giant deer, wild horses found there as well. The find was donated to the zoological cabinet of Kharkov University. 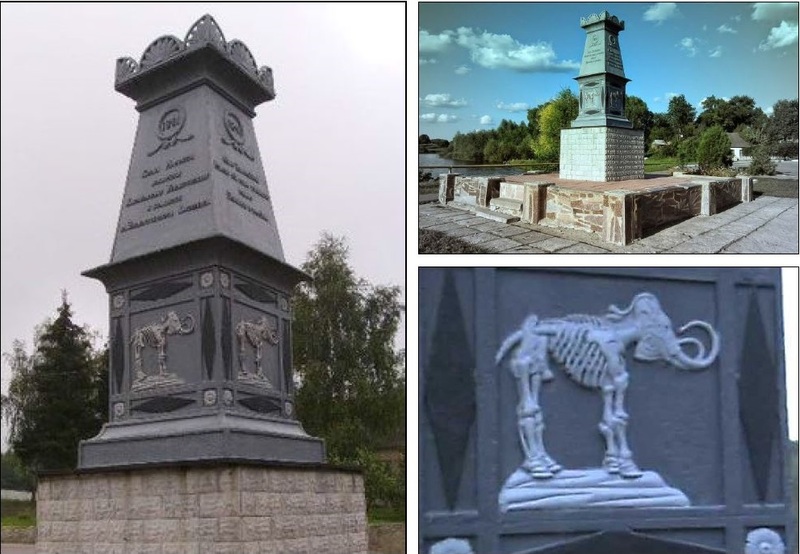 Follow the suggestion of Professor Kalinichenko and with the participation of of the landowner Yurij Golovkin, 3-meter cast-iron memorial was installed on the place where the bones are unearth in 1841.